Balboa Park is one of the nation's best and most versatile city parks. In addition to plenty of green grass, its 1400 acres contain museums, theaters, meeting rooms, one of the world's best zoos, an artists' colony, and facilities for over a dozen common and not-so-common sports. It is one of San Diego's top attractions. Set aside in 1868, the park was begun only three years later than New York City's Central Park, and two years ahead of San Francisco's Golden Gate Park. Although it has been developing for over 100 years, Balboa Park was given major boosts when it hosted the Panama-California Exposition of 1915-1916 and the California-Pacific International Exposition of 1935-1936. Many of the buildings from these expositions still stand. They provide interesting architecture, as well as homes for museums, meeting rooms, and sports facilities. This walking tour is divided into two parts. The first walk features the El Prado area, and takes you back to the days of the 1915-1916 exposition. More about the 1915-1916 exposition... The buildings erected for the expo feature Spanish Colonial architecture, and now provide homes for many San Diego museums and arts organizations. The second walk is a walk for a Sunday afternoon. Here you will find many buildings from the 1935-1936 exposition, the most notable ones reflecting Mayan and Indian design. More about the 1935-1936 exposition... They are now used for museums, sports facilities, and meetings. The highlights of this walk are the Sunday afternoon organ concert and a visit to the "open houses" given by the many nationality groups that occupy the cluster of small cottages known as the House of Pacific Relations. In the summer months, the groups supplement their Sunday afternoon festivities with folk dances and entertainment in native costumes. Hours vary among the museums, but it's typical for them to open at 10 in the morning and to close somewhere between 4 and 5 in the afternoon. Many museums are closed on Mondays, and some are closed on Tuesdays as well. Most of the museums charge admission. Typically, adult admission prices range from $5 to $10, with discounts available to seniors, military, students with ID, and children. In addition, most museums offer free entrance one Tuesday each month. 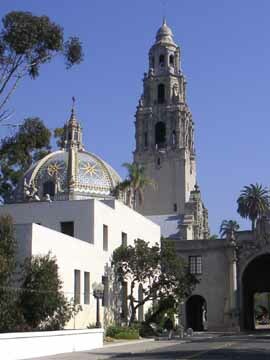 If you plan to visit several museums, you can save money by buying a "Passport to Balboa Park," which provides entry to most of the park's museums. They are sold at the participating museums, as well as at the Balboa Park Visitors Center, located in the House of Hospitality.